I'm so excited to announce that all the new February Release products are now available to purchase! You can find them here in the MFT Boutique. 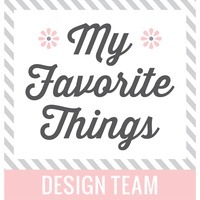 Don't forget to visit all participating team members' blogs for more inspiration and leave comments on each blog for a chance to win one of two $100 MFT gift vouchers. 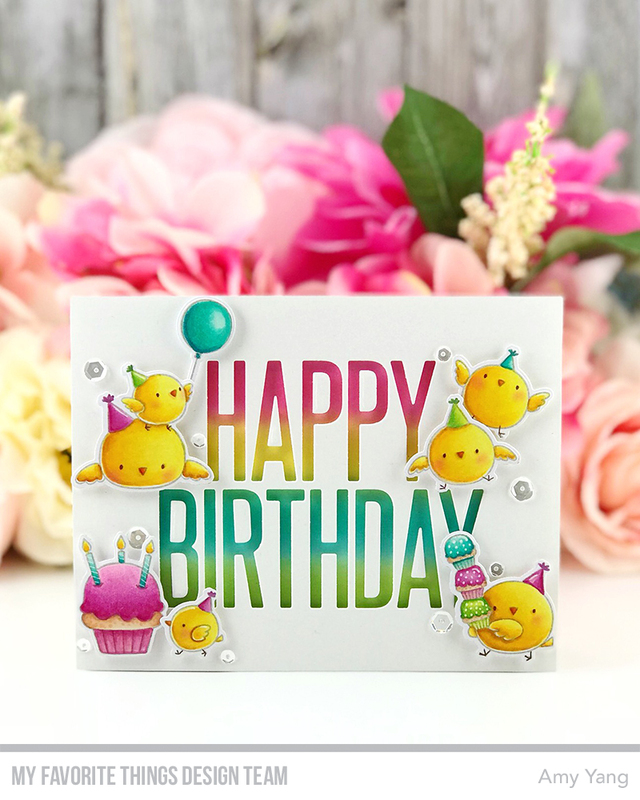 Today, I'm sharing a birthday card I made with the super cute BB Birthday Chicks, and the Big Birthday Dienamics. Don't you think these two are a "must have"?! 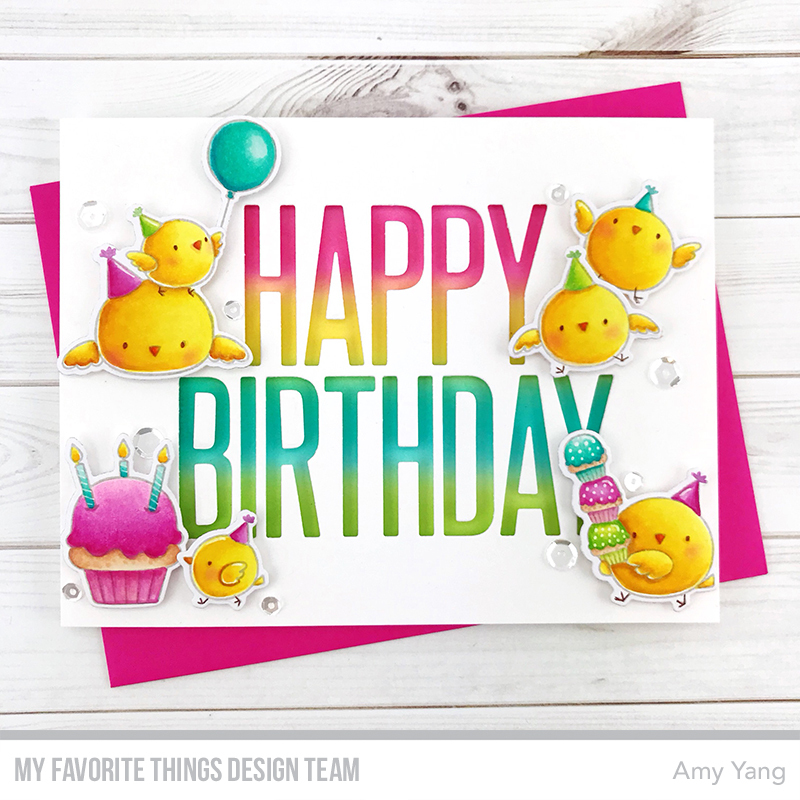 To begin, I stamped the images from the BB Birthday Chicks with Cement Gray Hybrid Ink on a Blending Card. The gray ink gives the images an almost no-line coloring look, which I absolutely love. I added some highlights with a white gel pen and drew in the leg/feet and eyes with a Brown Copic Multiliner. I cut them out with the coordinating dies. For the background panel, I blended smooth white cardstock with Picked Raspberry, Fossilized Amber, Peacock Feathers, Twisted Citron, and Mowed Lawn Distress Inks. Then, I die-cut a white A2-sized front panel with the Big Birthday Die-namics and mounted it on top of the background panel with Foam Mounting Tape. To finish, I mounted the images to the front panel and added some Sparkling Clear Sequins. For more information on the New Release and the Blog Hop, visit MFT Blog. Thank you so much for joining me all week! Have an amazing day and Happy Shopping! Great card as have all of the rest of them for this release. Love those adorable chicks! Your colors are so bright & cheery! Such a happy card--love the colors. I just love your coloring style! The grey ink was such the perfect choice. Love the colorful rainbows background, too. 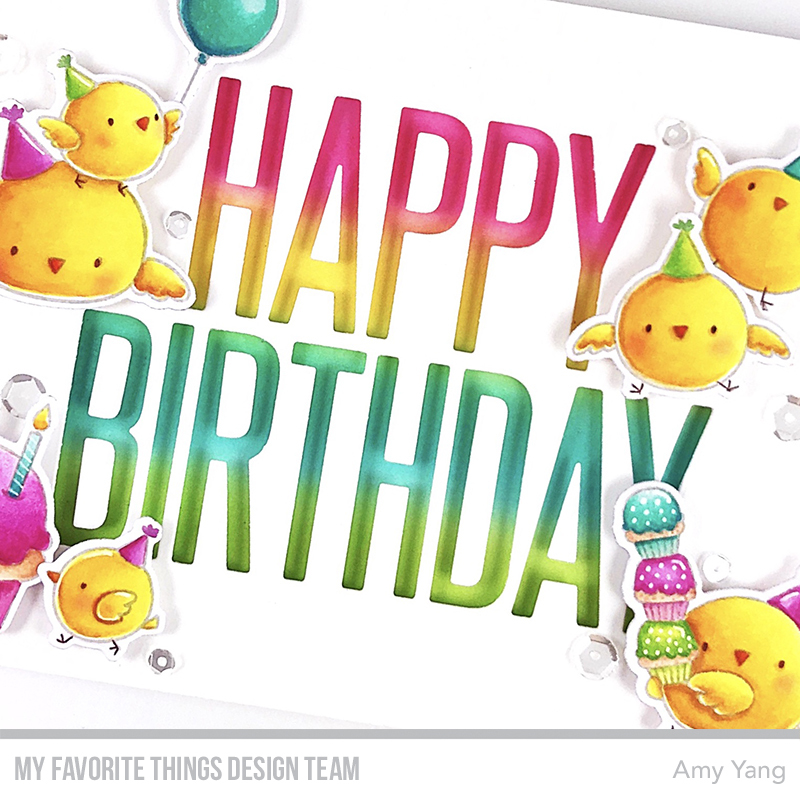 Great colorful Birthday card, very cute! That card would make anyone smile, love it! Your card is way too cute! Stinkin' cute and colorful - love it! Love the color blending on your letters. Lovely. your card is so bright and colored perfectly!!! Such a cherry birthday card, Amy! Love your bright colors and thanks for sharing your tip on stamping with grey ink. Love the colors on this card, placed my order tonight and can’t wait to receive my goodies which these sets are included, thanks for sharing! 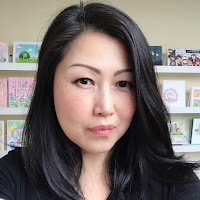 Love your card Amy and yes I agree, both these products are must haves! I have already ordered both... just have to wait until they arrive. Thanks for all the inspiration you have provided over the last few days! Just love this bright, colorful beauty! Beautiful coloring and fabulous design! Beautiful card with beautiful colors. Awesome birthday card, love it! Love the vibrant colors used! So very pretty! So cute! 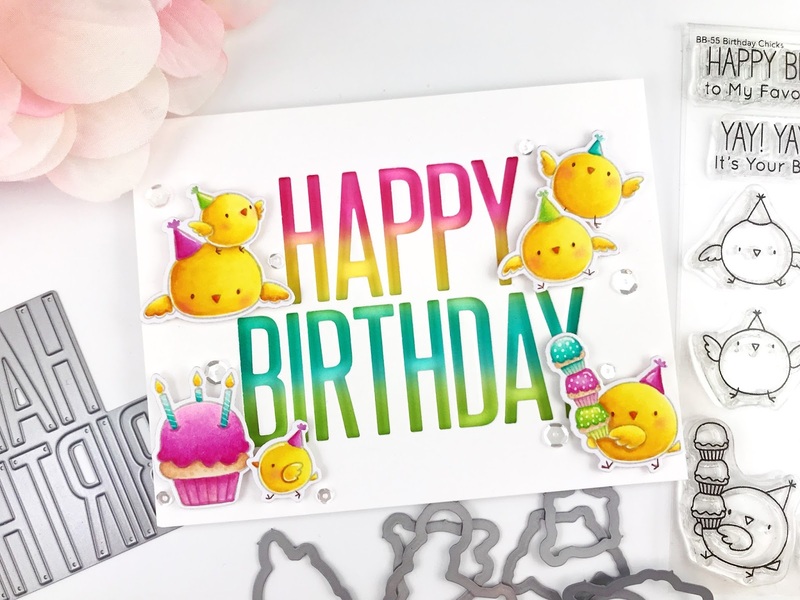 I love the colors and how you used the happy birthday die! Your card is absolutely adorable! Love the colors and those darling little chicks! Love your cheery colourful card. Great tip about the grey ink. Those little Birdie Brown chicks are the most. So adorabbe, expressive and busy. Gotta have. I love your bright cheery card. Those birthday chicks are just adorable! Wow! I love the bright colours and the "storybook" type vibe to this! beautiful coloring. I love that background. Your card is adorable! I love the bright colors. This card makes me smile! Adorable card! Super colorful & FUN! Awesome new products! OH those chicks are so sweet...love the blending on this card. This is a super sweet card. I love the bright colors you use in the card. Thanks so much for including the copic color numbers you used. Love the background and how it showcases the words! The colours are joyful and the chicks so well coloured! Fab card! Those birdies are just too tweet and your coloring on the letters is amazeballs! I love this card - its so colorful and totally reminds me of Spring. Great Job! I'm so excited that I ordered this set! I love the background behind the HB die cut! Brilliant! Oh, your coloring is amazing! You matched your copics with the distress inks perfectly, and I love how it all comes together. Thank you so much for sharing it with us! Absolutely adorable! Love the colors. Oh, this is sooooo adorable!! Love these sweet little chicks and your fabulous multi-colored sentiment! I love, love, love that birthday sentiment die :). And your card is just lovely. What a fun birthday card! Love the chicks and the colors you used! Those little chicks are so adorable! Such a happy card! I love how you colored the chicks--these stamps are so darling! Everything about this card is perfect! I absolutely love it!!! What a happy card! I think the way you colored the chicks is really beautiful! So super cute, Amy!! Love your bird coloring and all the bright colors make the card so cheerful!! Such a fun, super cute card!! The colours are so cheery and everything is coloured so beautifully. Sure to bring a smile to anyone's face. so fun!!! I just love those little chicks and you have colored them to perfection!! Those birthday chicks are sooooo cute! I love the colours you used on your card - so bright and cheerful! OMG this card is sooo bright and cheery. It really made me smile. Love your use of the product. I love how happy and cheerful this card is. Beautiful! Those chicks are just adorable!! I really love the colors you used together on your awesome card! What an adorable card!!! I love your colouring! I love your copic coloring of those cute birthday chicks! I'm in love with those little chicks! I was looking for this information and I got it here,so that I always get the information here what I am looking for.